The only thing more amazing than the amount of work volunteers can accomplish in a short period of time is the diversity of tasks they perform. The C&O Canal has an annual visitation of approximately four million each year. Many of those visitors develop a strong connection to the park and decide to return as volunteers. The park has a variety of opportunities for volunteers to be engaged along the 184.5 miles of the C&O Canal. We have everything from librarians and historians to Canal Stewards and Bike Patrollers. There are many unique ways for volunteers to give back to the park they enjoy so much. The C&O Canal Trust's Canal Pride Days event at the Abner Cloud Mill ruins is a perfect illustration of volunteers working to enhance the park. The Abner Cloud House is the oldest existing structure in the park. In 1801 Abner Cloud, Jr., built a random rubble stone house with the help of Italian stonemasons, probably using stone from local quarries. Mr. Cloud also built a mill nearby, further to the west of the house but south of the Chain Bridge. The mill produced locally popular "Evermay" flour when it was in operation in the early 1800's. Only remnants remain of the mill today. 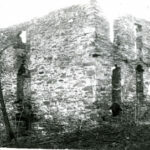 Although the mill is frequently referenced in literature about the Abner Cloud House, the mill ruins were hidden from visitors due to dense vegetation covering them. 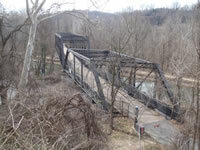 The dense vegetation is now gone thanks to a recent C&O Canal Pride Days event. Volunteers attacked the overgrown brush with loppers, pole saws, and determination to uncover a piece of history in the park. We were not certain of the condition we would find the remnants of the mill after being covered so for many years. After several hours of hard work and two 30-yard dumpsters full of vegetation later, the ruins were revealed. It was a significant effort to uncover this hidden piece of park history. 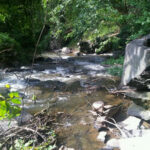 In order to prevent the mill ruins being lost to vegetation again, the site will be entered into the Canal Steward Program, which allows groups and individuals to adopt and care for a section of the park on a regular basis. The duties at the Abner Cloud Mill will include pruning vegetation as necessary and keeping the area clear of trash and debris. Projects completed at the Trust's C&O Canal Pride Day events improve park locations and enhance the visitor's experience. 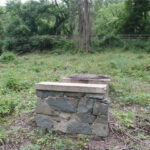 The C&O Canal Trust works with park staff to address park areas that need a little extra attention and the Trust recruits volunteers to complete the tasks at each location. Together, volunteers and park staff make a difference. 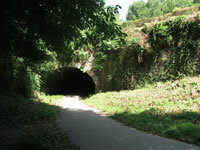 The C&O Canal significantly benefits from the hard work and determination of its volunteers. A park that is a 184.5 miles long is a logistical challenge and one that our volunteers are, without question, up to meeting.